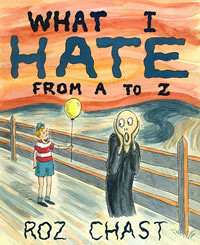 With apologies to Roz Chast, whose new book is pictured above and who has given me more good chuckles than any other cartoonist past or present, I offer you my A to Z list of what I hate about wine. Please notice the tongue in cheek; I only wish I could do the drawings to go with my list. Roz, are you out there? Got a list of your own? Give it a shot. Or make it easy on yourself – just pick the vowels. Chime in! but need help with one term, what is a "naked" wine? Ted - A number of wineries offer wines labeled "Naked" which generally refers to un-oaked white wines such as chardonnay. hmmm, I prefer a white burgundy to Kendall Jackson because it is more like the grape and less manipulated. is it the style of wine making or term to which you object? Ted, this post is supposed to be slightly humorous, ok? I have written dozens of columns on unoaked wines, and I am generally very positive. I find the term naked to be a little silly, that's all. Humorous indeed, but show some love for the hybrids! I'd rather have a nice glass of Marechal Foch or Chambourcin than an uninspired Pinot Noir. Geeks guzzling the good stuff? Wine geeks, you mean? Who deserves it more? Have we all lost our sense of humor? Paul, great post and some *serious* competition from the WA winemakers list! Anon: I am staring at that naked 'K' – very clever. And I give you bonus points for Xinomavro. Nice job! Blake - my point is not that geeks don't deserve good wine; they do. My point is that wine geeks should understand that SHARING that bottle is an important part of the experience. Greed has no place at a wine tasting. Of all the letters in your A to Z, I laughed at 'F'. Matching rules are for suckers. Well played, Paul. K for "high potassium" is pretty clever too! How exactly does one detect "volatile acidity"? Great stuff, Paul - and though tongue in cheek, I do love the truth that lurks within. For me today, I'll just toss out an "N" - Ninety-somethin' or nuthin'. Dude, 26 pees is what I felt like taking after I compiled it! (Thanks for checking in).